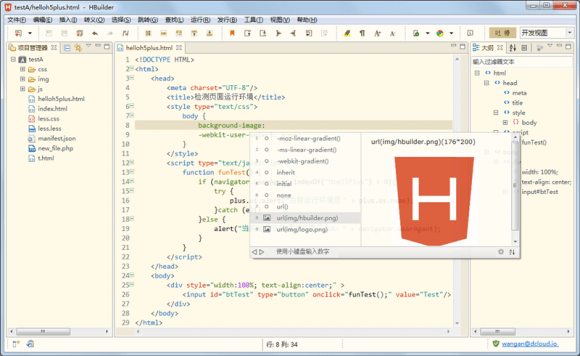 HBuilder is an IDE that enables accelerated HTML5 app development. It’s the first of its kind in China and Dcloud, the team behind it, believes it’s among the best around the world. Dcloud has figured out some ways to improve the performance of HTML5 mobile apps — closer to native apps. Also it enables better performance on low-end Android devices which account for a large part of Chinese smartphone market and will be the major market driver in the near future. Unlike most on the market worldwide, HBuilder is for free and doesn’t plan to charge developers for any services related to app development. The team has a bigger plan. Dcloud, a team of 10+, started building the tool from early 2013. It’s a spin-off from Digital Heaven (or Dheaven), a business software solution developer, whose board members were not supportive of the idea of building a development tool for improving the performance of HTML5 mobile apps. Wang An, then GM and chairman of the board at Dheaven, but was the initiator of the project. To make HBuilder possible, he would resign as GM at Dheaven and become the CEO of Dcloud (still the chairman of the board of Dheaven though.). Both the excitement about HTML5, which enables Web-based sophisticated applications, and issues in technical limitations have been around for a long time. Today, as all kinds of Internet service providers see more and more traffic or income coming from smart mobile devices where are dominated by native apps, certain tech companies want a shift to the Web-based. Browser providers found users didn’t have to open a mobile browser in order to consume any content; search engines cannot index content in native apps which account for the majority of the mobile Internet. Now search engines like Google are encouraging developers to apply their methods to make in-app content indexable. In China, the leading search service Baidu initiated a Light App campaign encouraging developers to make their content search engine-friendly and accessible in the Baidu mobile app. Chinese mobile browser company UC Web also came up with a similar program so that users will visit its browser first and then click open the web-based apps submitted onto it. Some Chinese companies actually have benefited from the UC Web approach through PC-based browser. After starting monetization, Qihoo 360, the Chinese company famous for monetizing users by channeling those of its free Internet security product to its browser, decided to introduce web games (or browser games) instead of client games, from which most Chinese game distributors had been making money. While client games require users to take time and effort to download, Qihoo users only need to click on icons of those web games listed on Qihoo’s browsers and then start playing games right away with a new browser tab. Qihoo made the right bet. Web games, many powered by HTML5, would take off in China soon. Now many tech companies like above-mentioned search engines and mobile browsers hope Web-based mobile content, with sophisticated features powered by HTML5, can turn the native app-dominated mobile world to their advantage. Dcloud hopes that to happen too. HBuilder is its core product that will attract developers — now there have been some 20,000, according to its CEO. Then the company plans to build an ecosystem around it, offering services like online forum for developers. Eventually the company will take on app distribution, hoping to create a new way of app distribution — like what Qihoo did — and possibly make revenues there. Some investors have bought the whole idea. Dcloud has introduced funding from Jiang Tao, who runs CSDN (one of the most popular media for developers in China) and is an angel investor, Harry Wang, a Facebooker-turned angle investor, and a big Chinese tech company.